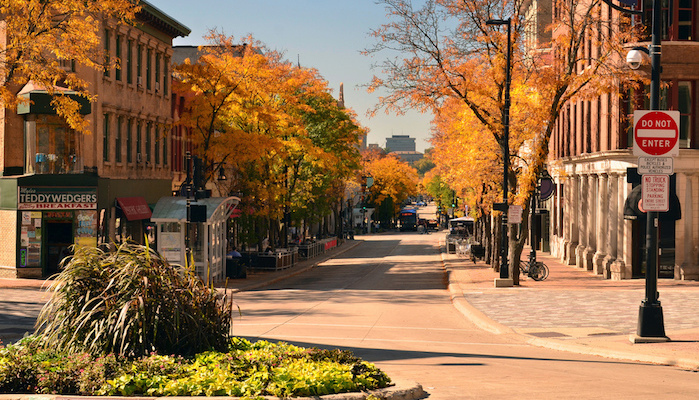 For a great tour of downtown Madison, runners flock to this busting route down State Street, the University of Wisconsin’s main drag for arts, eats, and entertainment. It’s a choice route for anyone who wants to explore the cultural vibe of the city center. State Street starts out in the heart of the University, just outside Library Mall. You can follow it east all the way out to the gorgeous grounds of the Wisconsin State Capitol. As an out and back, it’s about 1.9 miles. The section through campus is closed to traffic, but there several crossings and lots of traffic west of there, so use lots of caution and be aware this might not be the best route to set your PR. However, it’s a lot of fun, especially if it’s your first time visiting Madison. Add-On: For more mileage, the Lakeshore Path or Yahara Parkway routes are nearby.